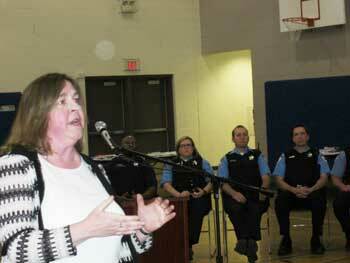 This article was originally published in the January 2014 COPS Community Policing Dispatch e-Newsletter. The original article can be found here. Through the “Not In Our Town: Working Together for Safe, Inclusive Communities” initiative, the COPS Office and Not In Our Town are creating new tools to help law enforcement and community partners work together to prevent hate crimes, improve hate crime reporting, and address underlying tensions that can lead to violence. Cook County (Illinois) Assistant State's Attorney Joy Repella serves as supervisor for the county's four Community Justice Centers. She was recognized for her work on hate crimes in 2001 with the U.S. Department of Justice Award for Public Service and in 2003 with Chicago Crime Commission's Award for Excellence in Law Enforcement. This past September, she was honored by the Association of Prosecuting Attorneys, along with Philadelphia elected District Attorney Seth Williams, with the Innovations in Community Engagement Award. When a prosecutor and a police officer joined forces for a statewide hate crimes training, they successfully shifted officers' mentality from “soldier” to “empathetic educator” and laid the groundwork for community partnerships engaging youth and diverse populations. In 1999, Illinois Governor George Ryan established a Commission on Discrimination and Hate Crimes to help ease tensions between different groups, reduce hate-related violence, and empower people to respond to discrimination and hate. Recruited to participate, Cook County (Illinois) Assistant State's Attorney Joy Repella and Chicago Police Officer—now Sergeant—Lori Cooper went on the road one year later to launch a series of trainings for prosecutors and law enforcement officers throughout the state. The curriculum they developed with a working group not only spread vital information, it planted seeds for partnerships and activities that continue to evolve and make an impact today. A brief review of their five-year collaborative training series reveals powerful, cost-effective strategies that can be replicated by agencies nationwide. Sgt. Lori Cooper, Chicago PD. Now in her 21st year with Chicago (Illinois) Police Department (CPD), Sergeant Lori Cooper is the commanding officer for CPD's Special Activities Section, which oversees hate crime investigations. 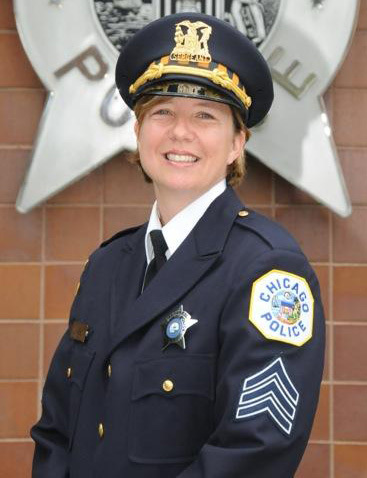 She became Chicago's LGBT police liaison in 1998 and is nationally recognized as an educator and advocate for strong, positive relations between law enforcement and the LGBT community. ASA Repella and Sgt. Cooper usually conducted trainings for groups composed of front-line law enforcement officers, state's attorneys, and community prosecutors, focusing on strategies for prevention of, and how to effectively investigate and prosecute hate crimes. They developed an approach that acknowledged existing challenges and was adaptable for different audiences. Another challenge the trainers faced was the burden of coming from Chicago, a city that might dominate, but does not reflect all other regions in the state. The trainers were careful to adjust the agenda to focus on the most pressing issues facing each audience. For example, while a Chicago group would be more familiar with hate crimes targeting an immigrant population or the transgender community; smaller towns might need less attention to these cases, and more discussion about leading a community that was rapidly becoming more diverse. As part of the trainings, Cooper presented relevant cultural diversity videos from the Chicago Police Department's (CPD) collection of 27 training videos, sharing basic cultural information and helpful guidelines for engaging with different groups. Depending on the audience, trainings might be planned for half a day or a full day—but the first task was always the same: humanize the topic by shifting the police officer mind-set from “soldier” to “empathetic educator.” Understanding that most officers came to the training thinking they would never be the victim of a hate crime, Cooper led a powerful exercise to help create the feeling of being a “victim community.” She asked participants to imagine they had just come into roll-call and learned that a fellow officer had been killed the night before—targeted solely because s/he was a police officer. Though police officers are not a protected class under hate crime laws, through the exercise she effectively demonstrated the importance of expressing empathy for hate crime victims. If they started out facing a room of officers with newspapers out and cell phones in-hand, by the end of the exercise, the trainers found they had complete buy-in from their audience. This training model provides many opportunities to increase impact while conserving resources. To start with, in each session Repella and Cooper distributed their business cards to attendees so they would have experts to reach out to if they had questions or faced their first hate crime in the future. Additionally, since the diverse community partners recruited for the trainings were drawn directly from the local communities participants immediately gained a valuable local partner. Though these sessions were originally funded by the state, the collaborative nature of the training dictates that multiple agencies and community partners must participate—and by extension, could then each contribute to the cost of developing and facilitating the training. By pooling partners, the model reduces the financial burden and human resources obligation for any individual agency. Finally, a very efficient adaptation of this model is the “trainer-of-trainers” strategy. As part of a regular (quarterly or yearly) gathering or event, one representative from each designated region participates in a hate crimes training. When representatives return to their regions, they conduct the same training for local agency leaders, who in turn conduct the training for their local agencies. Though Repella and Cooper conducted their last collaborative training in 2005, their work resulted in a dynamic network of partners and innovative activities that continue to evolve and make an impact today. The CPD and Cook County State's Attorney's Office Community Justice Centers have independently continued to conduct similar hate crimes trainings locally, partnering with groups like the Commission on Human Relations, Chinese Mutual Aid Association, and the Center on Halstead (Chicago's LGBT community center), among many others. An exciting collaboration between CPD and the Greater Chicago/Upper Midwest Region of the Anti-Defamation League last year resulted in a new online hate crimes training curriculum for police officers—the first in the country. One Cook County State's Attorney's Office Community Justice Center implemented a wildly popular program with local middle schools, organizing mock trial sessions where students prosecute a hate crime. Using a set of facts drawn from many different cases, the center challenges students to serve as judge and jury for a complex case—then leads a candid discussion with the group about their personal reactions. In response to the center's outreach, 35 schools participated in one year! In addition to new community partners, Cooper points to a closer working relationship with the FBI and their Civil Rights Unit, and wide use of CPD's cultural diversity training videos. For example, before the Jewish High Holidays or Gay Pride month, officers watch related videos, as well as the hate crimes video, during roll-call; after the 2012 shooting at the Sikh Temple of Wisconsin, they watched a video about the Sikh community. For ideas and resources to create or expand a hate crimes training in your community, please visit the “Working Together for Safe, Inclusive Communities” online hub at NIOT.org/COPS or contact info@niot.org.